You May Not Want To Look: Blobfish Named 'Ugliest Animal' : The Two-Way The whimsical Ugly Animal Preservation Society held an online vote to find a mascot. The blobfish, "a mass of pale, jelly-like flesh with puffy, loose skin," is the "winner." At first glance, we thought it was a Star Wars character. But, no, the blobfish is a real creature that bobs around in the waters off Australia. And now it's the "winner" of the Ugly Animal Preservation Society's online vote to choose a mascot. 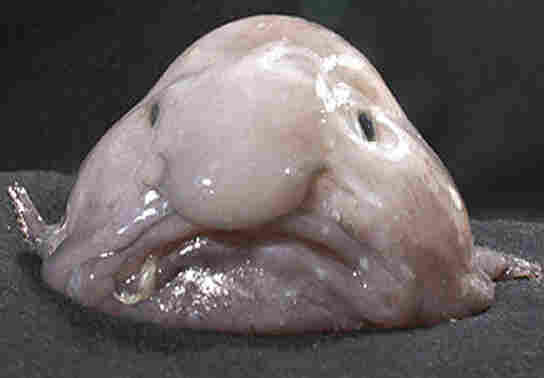 Or as the society and the British Science Association say, the blobfish has earned the title "world's ugliest animal." The society is a whimsical British organization that mixes comedy with science to raise awareness about "the threats facing ... weird and wonderful creatures," the BBC says. According to the BBC, the blobfish won the society's contest "by almost 10,000 votes." -- The flightless dung beetle. "This is one of the funniest fish faces in the ocean, although you're not likely to see a blobfish since they live in very deep water off Australia. In fact, it's pretty rare for anyone to see blobfish, although they're sometimes taken in nets hauled in by Australia's deepwater fishing fleet. They really do look like a big, blobby tadpole, just a mass of pale, jelly-like flesh with puffy, loose skin, a big nose, and beady, staring eyes. But looking like a floppy water balloon is what actually helps the blobfish make a living. This guy just sort of floats above the sea floor so it doesn't have to spend a lot of energy swimming around, sort of like when you float in the water wearing a life jacket. "Blobfish seem to grow only to about 12 inches, about as long as a comic book. No one has seen them feed, but scientists think blobfish probably just open that big mouth and let little particles drift in — this is not a critter built to chase down its food." According to the BBC, by the way, blobish are inedible.